The Bureau of Labor Statistics indicates that 107 workers in Georgia lost their lives due to occupational injuries in 2011. These workers died as a result of workplace violence, car accidents, fires and explosions, falls, exposure to harmful substances or environments and/or contact with objects and equipment. Those who are killed in workplace accidents often leave behind grieving loved ones who face financial struggles. Under Georgia’s workers’ compensation laws, those left behind are usually not allowed to sue an employer over a workplace death, but they could be entitled to file a workers’ compensation claim for death benefits. An experienced Atlanta workers’ compensation lawyer at Parson & Associates, P.C., can assist you in obtaining death benefits after a loved one has been killed at work. Georgia law establishes the types of benefits available under workers’ compensation when someone dies in the workplace. Payment of funeral costs and expenses. An employer is required to pay a deceased employee’s reasonable burial expenses. According to O.C.G.A. 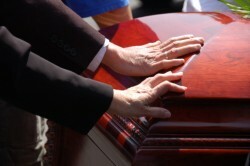 § 34-9-265(b)(1), an employer may be required to pay as much as $7,500 in funeral costs. These benefits are paid out in any situation where a work injury was the direct cause of a worker’s death. This includes situations where a worker is involved in an on-the-job accident and dies immediately as a result. It can also include situations where a worker suffers injuries in a workplace accident and dies from them after hours, days or even weeks have passed. If the worker was receiving benefits and then he or she later died from the workplace injuries, then death benefits are still available, but the number of weeks of eligibility could be reduced. Under Georgia law, dependents are entitled to weekly workers’ compensation death benefits only if they were wholly or partially dependent upon financial support from the deceased. The law distinguishes between primary beneficiaries and secondary beneficiaries in determining who can receive workers’ compensation death benefits. Primary beneficiaries include individuals such as minor children who were totally reliant upon the deceased for the money they need to live. If a primary beneficiary is receiving workers’ compensation death benefits, secondary beneficiaries may not be entitled to receive any money from workers’ compensation except under special circumstances. Minor children are presumed to be primary dependents and are entitled to receive workers’ compensation death benefits if their parent dies as a result of work-related injuries. This can include stepchildren, children born after the worker dies, children who have been legally adopted and children born out of wedlock. Married children are not included. To be presumed eligible for benefits, a child must be under the age of 18, under the age of 22 if enrolled in school full-time or over 18 but physically and mentally incapable of earning a living. Spouses are generally presumed to be entitled to workers’ compensation death benefits and are generally considered dependents provided that the couple was not separated for 90 days prior to the death. Those who are not presumed to be dependent, such as other family members who were being supported by the deceased – elderly parents, for example – may also prove that they were dependent and that they are entitled to benefits. It will be necessary to prove that the deceased was providing financial support for at least three months prior to the workplace accident in order for these other family members to show they are entitled to the weekly death benefits. The dollar amount of weekly death benefits paid to dependents varies depending upon a variety of factors. The amount is based upon the wages that the deceased was earning prior to death. The amount also depends upon whether the dependent receiving the money was considered wholly or partially dependent upon the deceased. In general, the available benefits may equal as much as two-thirds of the average weekly wage earned by the person killed at work. However, there is a weekly maximum payout of $500 per week as of 2013. Furthermore, spouses with no children are limited to receiving a total of $150,000 in benefits as of 2013. Death benefits paid to a spouse will also end in the event that the spouse remarries. A surviving spouse can receive a maximum of 400 weeks of payments. In the event that the employee died as a result of an employer’s intentional act intended to cause injury, additional benefits of up to $20,000 could be available. These benefits are paid in the form of a 20 percent penalty added to each week’s death benefit payments. At Parsons & Associates, P.C., our experienced Atlanta workplace accident lawyers will work hard to defend your rights and to get you the workers’ compensation death benefits that you deserve. It’s important to act promptly to make sure you don’t waive your right to benefits. To learn more about how we can help you, call us today at 770-422-9000, or fill out our online contact form to schedule a free consultation.